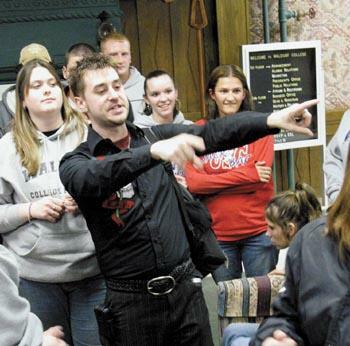 Ghost Investigating 101 – Hear stories from Ross’ most intriguing and haunted cases, see real evidence and learn how to become a real ghost hunter. Communicating with Spirits – Learn different methods employed to communicate with the spirits around us. Voices of the Dead (E.V.P. Electronic Voice Phenomena) –Learn about the tools used to capture EVPs and hear examples of spirits trying to communicate with us. Spirit Photography – Learn the history of what started the ghost hunting movement way back in the 1850s. History of Hauntings – Learn the history of ghosts and discover the Who, What, When, Where, How and Why of our interactions with them? Our Strange Death – Learn how to read historic tombstones, symbols and their meanings as well as how our predecessors dealt with death throughout the centuries. Each presentation run between ninety minutes and two hours and is includes a PowerPoint presentation style. Locations must provide a view screen, projector, audio and wireless microphone if possible. If you do not have the necessary equipment, please let us know as soon as possible so arrangements can be made. Prices and fees for lectures and presentations vary and can be negotiated. UFO Paranormal Conference ’02, UFO & Paranormal Conference ’03, Psychic Spectrum workshop, Boeing Paranormal Group Workshop, Lou J Free showcase, Mensa, Bush School Workshop, Boeing Psychic Expo ’03, The Skeptic Club, The Ghost Club, The Deerfield Inn, The Rose City Para Con, The Ghost Hunters Getaway and the National Ghost Hunters Getaway….. plus so many more.